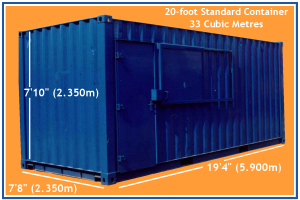 A 20ft storage container is considered a standard container. Standard shipping containers/ storage containers are 8ft 6in high on the exterior. The container is comprised of 14-gauge corrugated steel panels throughout. It has lockable double doors on one end. It is equipped with 1- 1/8″ thick marine plywood flooring on the interior.